A mile from our house, I stopped at a stop sign and sucked in a breath of wonder at the colorful feast before my eyes. 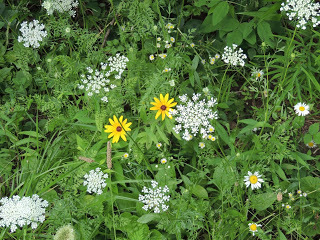 The ditch was filled with white lacy Queen Anne’s Lace, bright yellow Brown Eyed Susan’s, and pale cornflower blue Chicory. It was if an artist had spent the evening painting a masterpiece right there in the ditch. Now to the Master Gardener it would have been a batch of unsightly weeds. But to me it was candy for the eyes! As I continued my drive, my mind went back over the years and I smiled. It was the Queen Anne’s Lace that tickled my memory and filled my mind with joy and laughter. I suppose it was my mom who first introduced me to this fun summer activity. I later continued this summer ritual with the children I babysat as a teen and later with my own children. I look forward to carrying on the tradition with my grandchildren. I remember lining up an array of various size bottles and jars on the top of the stove filled with water. Mom’s stove was next to an eastern window in her tiny kitchen and the morning sunlight always provided a spotlight to whatever botanical treasure we would find and display. Next we would add different colors of food coloring to each bottle of water. A search of the pasture and yard always produced armloads of the frilly white flower we called Queen Anne’s Lace. Then we would fill each vase with as many flowers as we could and wait for the magic! Sometimes as early as that evening, if we looked really close we could see the water color seeping into the veins of each tiny petal. As the days unfolded our bouquets became red, blue, green and yellow. It was so exciting as we monitored the progress each day. Little did I know that a science lesson had been done, we just enjoyed the JOY of the activity. Of course, each year Mom would tell me the folklore of how a princess was held captive and forced to produce lace. One day she pricked her finger and a drop of blood fell on her work. To this day, a tiny spot of dark red can be found in the center of each Queen Anne’s Lace flower to remember her story. Now, I have no idea where this story originated from or if there ever was a Queen Anne with a sorrowful tale. But, this storytelling would accompany our search each summer. Here’s how you can try this activity. Older children could chart the progress, even measuring how quickly the dye travels up the stem.